And on the second day, there was gold. Almost. 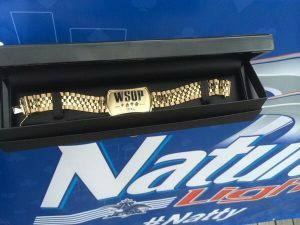 The first WSOP gold bracelet of the year was to have been presented, photographed, and given to its new proud owner. However, two players are still vying to be that person as the Casino Employees event ultimately had to stop before declaring a winner. The big news of the day was the $1K PLO tournament, a new one for the series. It was the first time the WSOP offered a $1K buy-in for anything but No Limit Hold’em, and the executives wanted to test player reactions. And if it made history … well, it did. 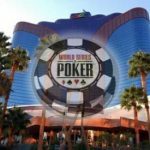 When the field hit 1,072 players, it officially broke the record to become the largest field ever for a non-Hold’em poker tournament. WSOP Executive Director Ty Stewart was a happy man. Two days of WSOP happiness, and only 47 more to go! The minimum payout at the beginning of the day was $1,529, but it was later in the evening that the benefits increased exponentially. Cameron Tullis was the player who bubbled the final table, taking home $4,888 for tenth place, and it happened at the hands of Corey Emery, who then took the lead into the final table with 500K chips. The field was reduced by more than half at the time of the dinner break. Selbst had a swing-filled day but sat in second place of the 20 remaining at meal time. 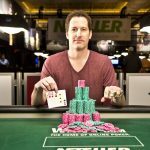 Calvin Anderson was ahead by 4K chips with 1,009,000 of them. With full bellies from dinner, they returned, and Justin Bonomo, Eugene Katchalov, and Phil Ivey busted. John Juanda was eliminated on the money bubble, guaranteeing the final 16 at least $54,945 for their work. This was the first event of its kind. 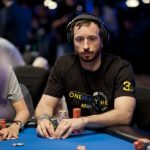 There had been PLO at the World Series in past years, obviously, but never with a $1,000 buy-in. 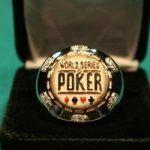 Players asked for a cheap non-Hold’em option, and the WSOP delivered. And when all was said and done, this became the largest non-Hold’em tournament in poker history. No corresponding 2013 event for comparison. The field thinned very quickly – much quicker than most expected – and the money bubble burst late into the evening amidst a flurry of eliminations. The minimum payout of $1,928 was in full effect, and names like Dan Smith and Huck Seed took that cash. Event 1 plays heads-up until one wins. Event 2 will continue, playing four-handed and aiming to reach the final table. Event 3 will resume and attempt to play down to the final table. Event 4 ($1K NLHE) begins at noon. Event 5 ($10K 2-7 Triple Draw Lowball Championship) starts at 4pm.